The Biosen series of glucose analyzers include three different models and are a familiar brand name in laboratories and diabetes clinics.Biosen analyzers can be manufactured as single channel glucose systems or as dual channel systems that can measure lactate at the same time.Biosen uses a special chip sensor technology to deliver fast measurements with a high degree of accuracy at a low cost per test. 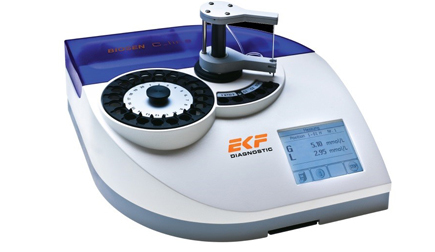 Due to the long life of the sensor chip the system requires little maintenance, features such as the touch screen and large memory only add to the Biosen analyzer’s user-friendliness.All Biosen analyzers are supplied with an interface to connect to hospital or lab information systems (LIS). An integrated barcode reader and printer are also available with most configurations. 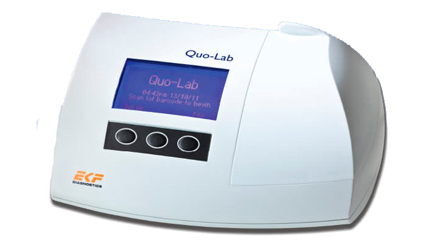 Quo-Lab™ A1c is a desktop point-of-care analyzer for measuring glycated hemoglobin (HbA1c). The semi-automated analyzer has been designed specifically to meet the needs of diabetes clinics and laboratories in settings that demand low cost of operation and ease of use. From a simple procedure, Quo-Lab™ provides lab-accurate test results within four minutes (CV < 3% at 7% A1c) from a venous or finger prick blood sample of just 4 μl. Quo-Lab™ uses the same boronate affinity methodology used by Quo-Test and is similarly unaffected by Hb variants. 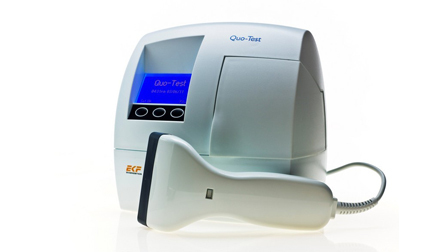 EKF Diagnostics' Quo-Test™ analyzer has been designed for easy and reliable HbA1c measurement for the monitoring and management of diabetes in a point-of-care setting such as diabetes clinics and doctors’ surgeries.The Quo-Test HbA1c is a fully automated hemoglobin A1c analyzer that uses patented boronate fluorescence quenching technology to measure glycated hemoglobin from a 4 μl sample taken from a finger prick or venous whole blood.Sample results are available within four minutes and are reported in IFCC and DCCT standard units (Mono S & JDS reporting are also available). Quo-Test is unaffected by most hemoglobin variants.